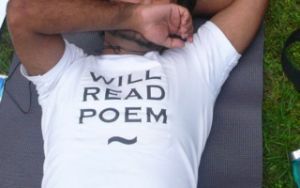 Vivek Narayanan’s two books of poems are Universal Beach (Harbour Line Press, 2006/In Girum Books, 2011) and Life and Times of Mr S (HarperCollins India, 2012). Narayanan is working on a book of poems, currently titled “The Jewelled Deer,” that attempts to “write through” the Ramayana of Valmiki (the earliest Sanskrit poet) in fragmented, unpredictable, and sometimes contrary ways. Beginning with but not limiting himself to features and passages in the source text and using a wide variety of formal strategies to do so Narayanan is exploring the distance between our poetics and Valmiki’s. He is 2013-2014 Radcliffe Fellow.